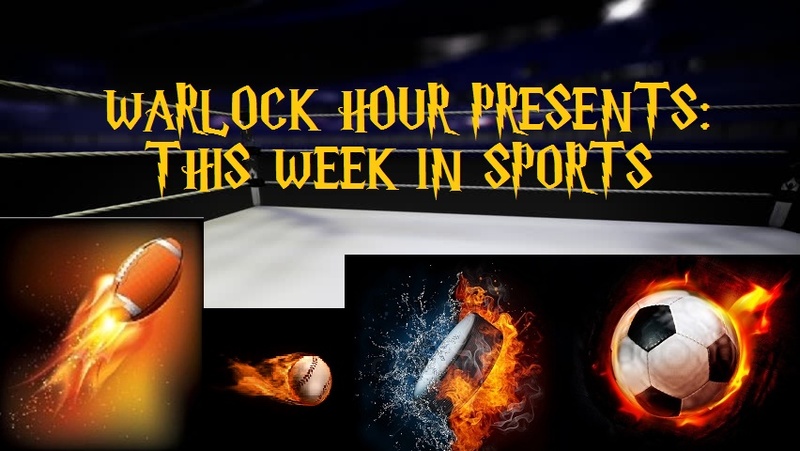 Ehnother Podcast presents This Week in Sports Episode 19! Apologies for being late this week, but once again I had an issue with the recording. Since Keith and I only had that one opportunity to record, we are going to take this week off from the Division by Division talk. So we will return next week when we begin with the NFC and talk the NFC East. However, I still have some NFL ‘news’, though I use the term news loosely. PLUS: MLB Standings; WWE Money in the Bank recap and WWE announcemnets. After the break are the NHL stories, including: NHL Awards, NHL Entry Draft and Trades. NOTE: We now have our own Twitter account for This Week in Sports AND our own Facebook page, check them out in the links below and subscribe to keep up to date. This entry was posted in This Week in Sports, Warlock Wednesdays and tagged AJ Styles, Anze Kopitar, Apollo Crews, Artemi Panarin, Auston Matthews, Baron Corbin, Barry Trotz, baseball, Braden Holtby, Buffalo Bills, Calder Trophy, Carrie Underwood, Charlotte, Dana Brooks, Dean Ambrose, Drew Doughty, EA NHL 17 Cover Athlete, Football, General Manager of the Year, Golden Truth, Hart Trophy, Henrik Sedin, hockey, Hockey Night in Canada, Jack Adams Award, Jaromir Jagr, Jim Rutherford, Joey Bosa, Keith, King Clancy Memorial Trophy, Kyle Wilson, Lady Byng Trophy, Lucha Dragons, Mark Giordano, Mark Messier NHL Leadership Award, Masterton Trophy, MLB, Money in the Bank, New Day, New Orleans Saints, NFL, NFL Talk, NHL, NHL 3 Stars of the Week, NHL Awards, NHL Draft, NHL Founation Player Award, NHL Trades, Norris Trophy, Patrick Kane, Pittsburgh Steelers, Rayzor, Roman Reigns, Ron MacLean, Rusev, San Diego Chargers, Selke Trophy, Seth Rollins, Shaun Shuisham, Shea Weber, soccer, sports, statistics, Sunday Night Football, Ted Lindsay Award, Terry Pegula, Toronto Maple Leafs, Vezina Trophy, Vladimir Tarasenko, Warlock Hour, WWE, WWE Brand Split, WWE Draft, WWE Money in the Bank, WWE Pay-Per View. Bookmark the permalink.